A wind of change is blowing for the Scorpions. The German hard rock band has announced they're packing it in soon after rocking like a hurricane for over 40 years. 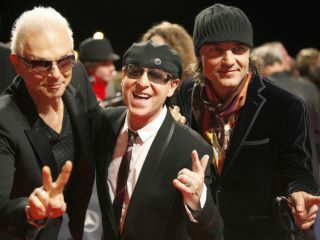 Known for hits like Big City Nights, Still Loving You and their biggest smash, 1990's power ballad Wind of Change, Scorpions said on their website Sunday that "we agree we have reached the end of the road" and would call it a day after releasing their final album Sting In The Tail and touring behind it. "Yeah, we're ending it," said guitarist Rufolf Schenker, who founded the group in 1965. "We're not getting any younger. We don't want to hear our fans saying, 'Back in the day they made great records.'" "It was always our pleasure, our purpose in life, our passion and we were fortunate enough to make music for you - whether it was live on stage or in the studio, creating new songs. "While we were working on our album these past few months, we could literally feel how powerful and creative our work was - and how much fun we were still having, in the process. But there was also something else: We want to end the Scorpion's extraordinary career on a high note. We are extremely grateful for the fact that we still have the same passion for music we've always had since the beginning. This is why, especially now, we agree we have reached the end of the road. "We finish our career with an album we consider to be one of the best we have ever recorded and with a tour that will start in our home country Germany and take us to five different continents over the next few years. "We want you, our fans, to be the first to know about this. Thank you for your never-ending support throughout the years! "We uploaded the very first snippets from our new album for you. And now…let's get the party started and get ready for a Sting In The Tail! See you on the world tour." Of course, there is an upside to all of this: In a few years the band could reunite for a lucrative comeback tour...right around the time they hit senior citizen status.